whatever happened to leon trotsky? : Solidarity and "troops out now"
Among other issues the upcoming Alliance for Workers' Liberty conference will debate our position on Iraq and Iran. This piece is intended to contribute to that discussion and explain some of the views of minority comrades. Within our organisation there is a substantial minority grouping critical of the leadership's attitude to the occupation of Iraq. We argue that the only principled line on the conflict, and only chance to build independent working-class forces, is to stand sharply opposed to US-UK intervention in the region as well as Islamism. In contrast, the majority argue that we should acquiesce to the occupation of Iraq, since if we demanded that the troops leave and they did, Islamist militias would win out and crush democratic space in Iraq. All of our comrades say they are for solidarity with Iraqi workers, and the debate is normally posed in terms of what slogans we should add to this position - demands like "troops out now", "troops out" or just a general sentiment "against the occupation". But is apparent that there is more to the disagreement than superficial differences in wording. The real divide is between those who believe that US 'globocop' actions are progressive but that socialists shouldn't "give them any credit in advance", and those who think that this misses the point of how to build an independent "third camp" of working-class forces which can stand on its own two feet. My own differences with Martin Thomas's conference document for the majority are only partly about analysis of what is going on in Iraq. While I have stressed the idea that the Mahdi Army - backed by the Iranian regime - and sectarian militias are increasingly integrated into the occupation government already, and deny that the imperialist troops protect Iraqi workers (the Iraqi government's Decree 8750 renders unions semi-illegal and gives it the right to confiscate all of their funds; the US Army have attacked trade union offices; while all of the British troops are safely ensconced near Basra airport, since Brown is too embarrassed to remove them even though Moqtada al-Sadr already controls the streets), Martin focuses on what would happen if the troops left. I do not deny his assertion that if all the troops magically "disappeared" and the Iraqi government collapsed, the consequence would just be the victory of the best-armed militias. I do not say “troops out now” because I want that to happen. But nor can I accept Martin's terms of argument. "Solidarity with the Iraqi labour movement against both the US/UK occupation and the sectarian militias remains the indicated policy for socialists internationally. We reject negative slogans like "troops out now" which the actual balance of forces would fill with a reactionary political content". This kind of schematic logic is no good. Marxists understand that social forces and classes do not exist in the abstract, isolated from one another, but instead that they are in struggle, and the subjective factor of political struggle can change the "balance of forces", which is neither fixed nor controlled by some ethereal hand of history. Martin's reference to "if "troops out now" were somehow to happen" makes no sense - in reality slogans do not mysteriously "happen" out of the blue, but are demands raised and fought for by real people. What interests us here is the slogans of the international workers' movement, the forces to which we are aligned and hope to influence. “Troops out now" is not merely a radical posture. Clearly, we do not raise the slogan because we are comfortable in the belief that we are so weak that the demand will never be realised and so it doesn't matter what we say. Yet we also know that if we ever did organise enough workers around our demands to force the troops out, then the balance of forces would have changed and so the consequences of withdrawal would be different to the troops just "disappearing" tomorrow. The problem with "troops out", i.e. missing out the word "now", is that in the context of the world we live in it would be seen to deliberately avoid saying "now" and give free rein for the troops to stay indefinitely. This looks like a variant of the majority view that we should accept the presence of troops until the trade unions do not need their protection. But the whole point is that the workers' movement will never grow to be in that position if it takes sides with the occupiers. While we may approve of some democratic side effects of the occupation, "refusing to grant it political support" at the same time as you go round telling people that you also "refuse to demand that the troops leave" is tonally and operationally nothing other than fostering illusions in the democratic credentials of the occupiers. In the case of the majority, this is worsened by clumsy formulations which, for all of the qualifications and equivocation which surround them, imply taking sides with US imperialism. Martin, whose conference motion presented to National Committee on 1 March avoided any reference to sanctions and the threat of "surgical" air strikes in Iran, had written in October that although plans for war against Iran were "crazy", it was possible to imagine that "if it were possible to imagine some "surgical" operation that would stop Iran's hideous regime acquiring nuclear weapons, and take out the foul Ahmedinejad, it would be good", which is precisely the wrong argument to be making at a time when US threats strengthen the hand of the Iranian regime against our comrades, since it is able to appeal to nationalism and portray itself as "anti-imperialist". The same goes for the argument that we should not call ourselves "anti-imperialist" since clerical reactionaries have adopted the label too. Firstly, if everyone followed the AWL's majority line, the result would be to buttress sectarian Islamist militias by allowing them to present themselves as the consistent opponents of the US Army, and by saying nothing about the need for Iraqi-Arab self determination we would concede an enormous amount of political territory to Islamists who claim that self determination should mean a patchwork of statelets run by clerical fascist mafias. And secondly, just because the words have been dragged through the mud is not a reason to abandon our politics - why should we not also dispense with the word "socialism", which for most people means something between Harold Wilson and Joseph Stalin? The question of working-class agency is of vital importance for the minority. Articles by comrades such as Daniel Randall and myself have stressed the need for a working-class anti-war movement demonstrating that only the workers' movement - and not Iranian regional imperialism and Moqtada al-Sadr - can fight for both democratic rights (including national self-determination) and social liberation. Rather than imagining that occupying troops will protect the working-class, we should be calling for the arming of the workers and supporting efforts at community self-defense. Also important here is working-class action at home - while actions such as those of the Motherwell train crew and the Italian dockers who refused to transport weapons for use in Iraq are occasional and receive little coverage in the Guardian, we must vocally propagandise about them as a means to undermine the war effort, and argue that they are necessarily the same struggle as oil workers in Iraq who strike against the looting of the country's oil by Halliburton. 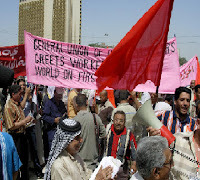 While in the lead-up to conference the majority have co-opted some of that point into their position, it does not sit well - if you think the occupiers' democratic war effort is the only hope for the Iraqi trade unions, how can you also be in favour of attempts to sabotage the troops carrying out that mission? To refuse to call for the withdrawal of troops is to refuse to pose yourself sharply against the occupation, and so weakens efforts to organise anti-war workers' action. The majority's position reflects an unwillingness to take on this important question and acquiesces to US imperialism as a guarantor of democracy for a supposedly eternally weak working class. In contrast, the minority argue that we must struggle for a strong and independent third camp, with the international left and workers' movement organising around the slogans "Solidarity with Iraqi workers against the occupation and Islamism. Troops out now". Well argued comrade - best of luck at your conference. Very interesting that the US SWP, used to have the slogan "Support Out Troops, Bring Them Home Now." They dropped the support out troops part, without any notice. The discussion in the US antiwar movement is different. There are two major coalitions against the war. One is run by Marcyites and the other is run by Dems. They never lead united actions. There is a backlash against the sectarianism. In Cleveland there will be a conference calling for a united antiwar movement. I think being "anti-imperialist" in a vacuum from a socialist program, is reactionary. That is nothing new to you. I agree with your direction. David -- what's the relationship of forces in the AWL? What are the relative sizes of the majority/minority tendencies on this question?